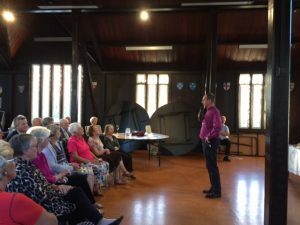 A very convivial evening at the historic and beautiful Selwyn Library on Thursday 16th March 2017 provided a perfect venue to learn about the historic building and Bishop Selwyn’s work for the Anglican Church community in Auckland. 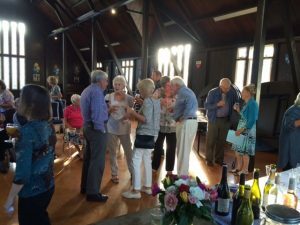 Over 40 people attended and enjoyed the company, the array of drinks and delicious food provided by the Parnell Executive team, along with stories of the early church. 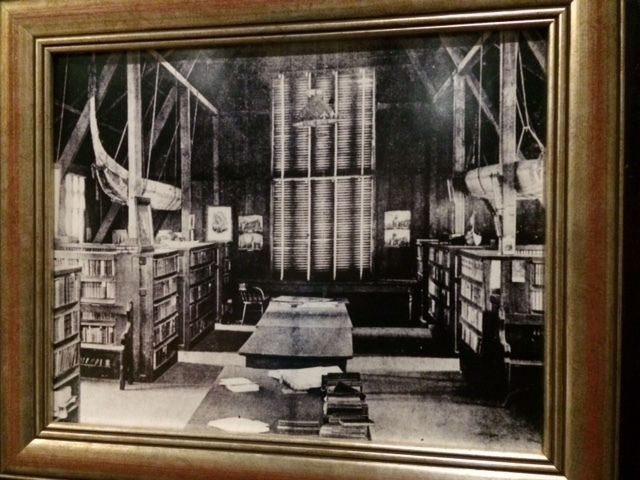 The above photograph shows the original Library and its shelves of books. Today the books have gone, mostly to St Johns College and perhaps some returned to England with Bishop Selwyn. 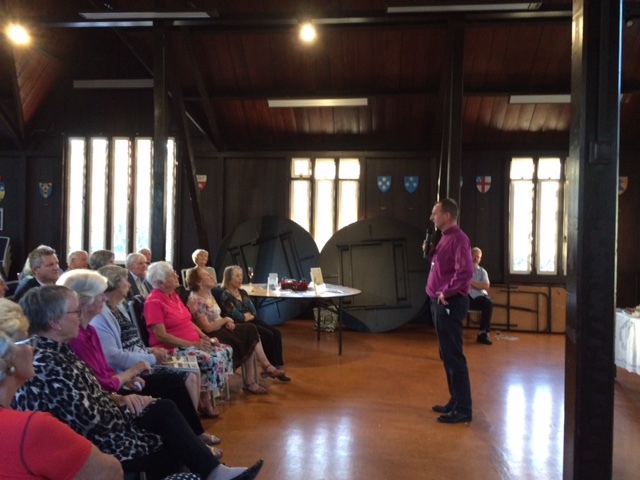 We were very grateful to Bishop Ross Bay (above), the current Anglican Bishop, who gave many insights into the history of Bishop Selwyn’s time in 19th Century Auckland and the buildings he inspired. Bishop Bay, a volunteer fireman no less, described what it is like to live in the Selwyn buildings today and the slightly quirky aspects of living in such an historic environment. After answering questions from a lively audience Bishop Bay went off to cook dinner for his wife and guests. Dr Warren Limbrick then took the floor and presented further background to Bishop Selwyn’s tireless work. 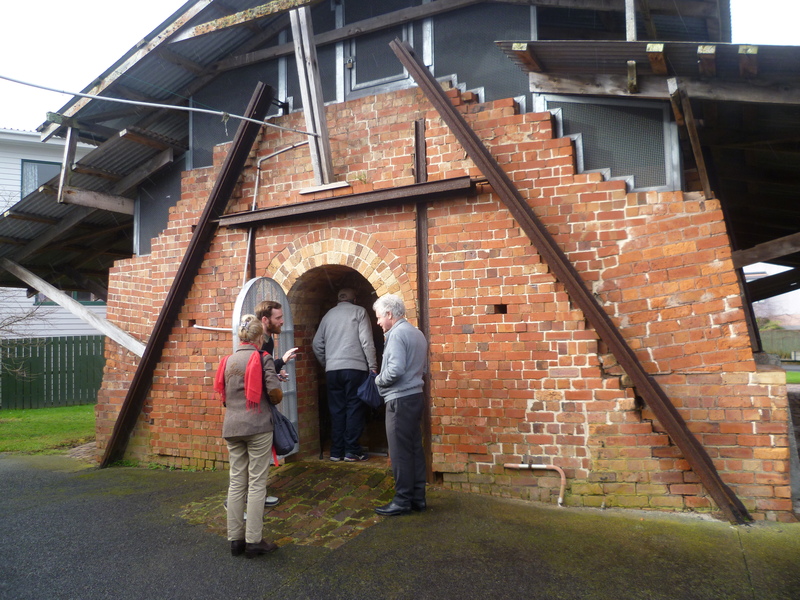 Dr Limbrick is producing a second edition of his History of St Stephen’s Chapel at Judges Bay with the support of Parnell Heritage. He has a wealth of knowledge of the Selwyn era in 19th Century Auckland and added fascinating detail to the stories. Julie Hill, co-chair of Parnell Heritage Inc., presented Dr Limbrick with an Honorary Lifetime Membership of the society in recognition of his service since its inception on 17th March 2005. No doubt the Selwyn Library has hosted many happy events throughout its history. We all went home feeling privileged to have enjoyed another such gathering with great company and many memories from Auckland’s past. What an amazing event this is! 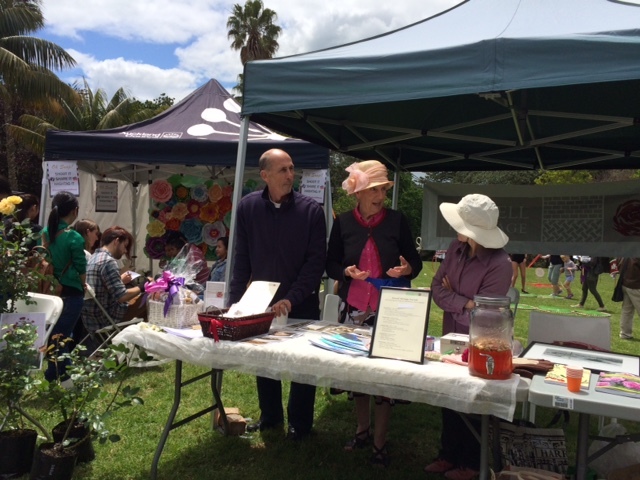 And our stall was a great success, especially with our very rare Parnell Heritage roses on sale. We were offering rose tea and it was great to speak to so many people interested in all aspects of Parnell past and present. Yes, it was windy to start with and a few drops of rain, but then the sun came out for most of the day. The rose gardens are magnificent with abundant beautiful roses wherever you look. A steady stream of people of all ages enjoyed the event, along with several pets, and an amazing variety of delicious snacks and fruit ice creams were on offer too. So a thoroughly enjoyable day for us all! A Shakespearean-themed launch of Journal No. 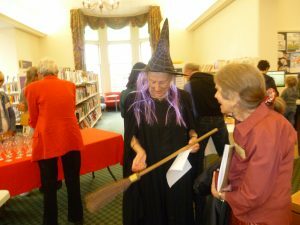 6 was held at the Parnell Library on 27th October 2016. Over sixty people enjoyed a very convivial evening with excellent refreshments and company. As one of the journal’s articles covers the Parnell Shakespeare Club that was founded in the winter of 1883, it was fitting that Miles Gregory, Director of the Auckland Globe Pop-Up Theatre, gave an address, and actor Adrian Hooke delighted us all with two Shakespearean soliloquys. To complete the theme, we were grateful to the Librarian at ACG Parnell College who lent us the Shakespeare photo booth, created by the students at the College. The journal has many interesting articles and, as with previous issues, is a unique and well-presented record of our history. Copies can be bought online – simply email enquiries@parnellheritage.org.nz giving your name, postal address and copy(ies) required. Issue 6 costs $12 to Parnell Heritage members, or $15 to non-members, and previous journals cost $10 each. Payment should be made to 06-0237-0114081-00, or cheques made out to ‘Parnell Heritage’ and sent to PO Box 37100, Parnell, 1151. Over forty members attended our Annual General Meeting this year, held at the Quality Hotel, Parnell, on 14th September 2016. The Victoria Room at the hotel, adjoining a pleasant bar area, afforded an ideal venue for the event allowing us all to enjoy a lively social time before the meeting started at 7.30pm. In addition to our complementary glasses of wine, flautists Audrey van Ryn and her sister Hazel played delightful music with a koha box available for a Charity for Homeless. Two pictures of local historic sites were on display along with a Unitary Plan map loaned by Cr Mike Lee. Mary Barry read her Chair’s report which was very well received, and Alastair Bell, Treasurer, presented the annual financial service performance statements , both of which were adopted by the members. Members of the Executive were re-elected, and Beth O’Loughlin is returning as a co opted Executive member. The Executive has its full component of nine members for the year ahead. Following General Business giving details of five upcoming events, Julie Hill introduced the panel of experts who each spoke on the effects of the Unitary Plan on different aspects of Auckland. The panel comprised: Shale Chambers, Chair of Waitemata Local Board; Jenni Goulding, Planning and Resource Management Consultant; Sally Hughes, member of Heritage Advisory Panel of Auckland Council, and Convener of Character Coalition and the public face of community heritage groups; and Mike Lee, Waitemata Councillor and member of the Governing Body, who has long service to Auckland city including Chairman of Auckland Regional Council, and he has strong connection to Parnell and to Waiheke Island. 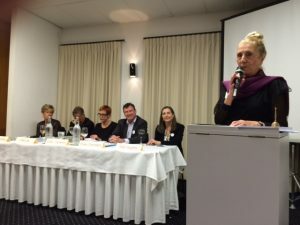 The panel speeches and questions from the audience were ably managed by facilitator Kirsty Cameron, Editor of ‘The Hobson’ magazine and journalist in Australia and New Zealand for more than twenty years. The successful and enjoyable evening ended just before 9.30pm and it was clear that Parnell Heritage Inc. is in very capable hands with lively support from residents and businesses in this part of Auckland. Welcome everyone to this, our eleventh AGM at the end of a turbulent local political year. I am pleased to tell you that heritage came out of the hearings with stronger recognition of its value within our city. Across Auckland this is not the case. Parnell Heritage is proud of its recorded submissions and presence at the hearings and our partnership with other community organisations. Parnell has managed to retain more of its heritage than other suburbs and we would like to think this is due, in some measure, to our work at the hearings. We want to take this opportunity to thank those members and supporters who helped us raise funds to be part of the umbrella organisation Character Coalition and to have access to professional advice including the pro bono legal advice of Rob Enright. The significant photographic skills of Luke Nuie, Chair of Parnell Community Committee, helped us to present professional documents for the hearings. Throughout the two years of the Unitary Plan process Louise Rooney LLB unravelled complexities and directed us to the correct sections through the maze of information, reminded us of dates for completion, and explained requirements for completion. On behalf of Parnell Heritage executive, members and supporters, our warmest thanks to each of you. We are fortunate to have a panel of knowledgeable experts here tonight to unravel some of the facts and fears of the Unitary Plan for Auckland’s future. Thank you to each of you. Our community activities, member events and commitment to the development and, shortly, the October publication of Issue 6 of our Parnell Journal, have meant a steady drum-beat of work for our executive. Parnell Heritage Inc. has maintained its membership at around one hundred and we hope that we will attract new members as awareness of the value of our natural and built heritage grows with the realisation of the risks faced from the development pressures in Auckland. Our events provide enjoyment and knowledge for everyone who attends. In summary, our financial position is sound with fundraising and income during the past year allowing for professional input to the Independent Hearing Panel through Character Coalition, along with representation where possible by exec members. Our Events team, led by Ann Littlejohn, has organised a variety of well received member events over the past year. 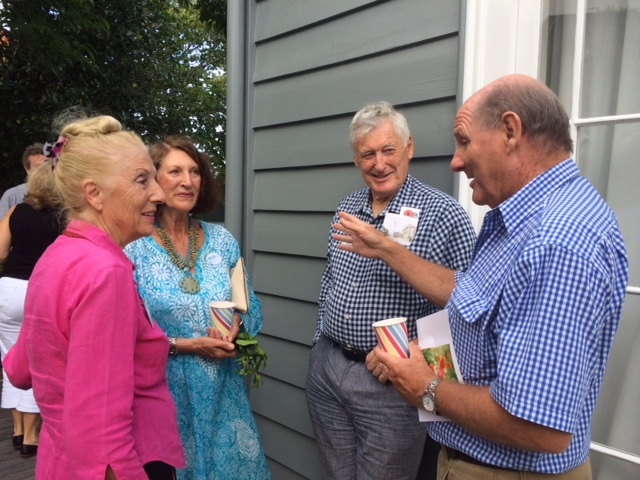 We had our first event of the year at a private home with a wonderful garden party at 5 Bradford Street, Parnell. 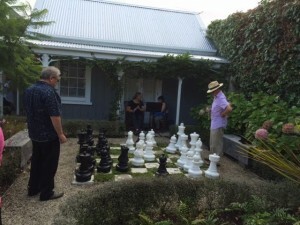 A unique design and plantings with an outdoor chess set surrounding a heritage house provided a delightful setting with music provided by Audrey van Ryn and her sister Hazel. Our thanks to owner Emmet Hobbs for the special opportunity that attracted a garden full of people! 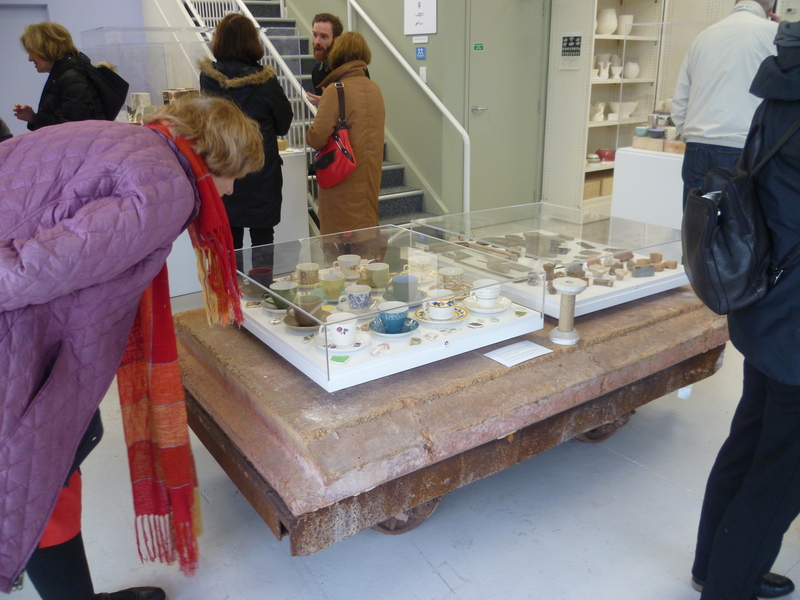 More recently a group of members and friends enjoyed a visit to the historic pottery and kiln guided by curator Finn McCahon-Jones, who opened up on a Saturday specially for Parnell Heritage. The characters involved in establishing this New Zealand icon were as fascinating as the huge range of products. We were in awe of the creators and workers who developed this enterprise. Parnell Heritage members with the leadership of Rendell McIntosh and the excellent co-ordination of Mary Stewart of Auckland Council work each year with Waipapa Stream neighbours, Parnell Heritage and Parnell Community Committee to increase plantings along the stream borders as well as clearing and tidying this area along the edge of the Domain. It is worth taking a stroll down there off Ngahere Terrace to see what is gradually being achieved. This project is supported by nearby Summerset Retirement Village management. Parnell Heritage presents exquisite miniature recreations of heritage buildings and homes that were lost in the Christchurch earthquake. Creator Richard Gardiner of Christchurch has flown here with these models for this event. A panel will discuss heritage protection under Auckland’s Unitary Plan. Details are on page 39 of your Auckland Heritage Festival programme and Auckland Council web site. Please note this is a once-only event and you need to book for catering purposes. Following our very successful launch last year of Journal five at Parnell Library, we are pleased to be returning to launch Journal six with the wonderful support of librarian Laura Caygill and staff. Look out for your invitation to this enjoyable event. The Journal team, ably lead by editor Joanna Boileau, with unstinting support from Jenny Leatham, member Susan Buckland, and including patron Rendell McIntosh, enjoys a rising appreciation of the content and quality of the Parnell Journal from its readers. I have had a sneak peek and there are some wonderful stories, none more so than the story of the Parnell Shakespeare Club which ran from 1883 to 1939 – fifty years. It probably wrapped up with the pressure of WW1 looming in Europe. It is particularly appropriate as a topic in this the 400th anniversary of Shakespeare’s birth and Auckland’s hugely successful pop-up Globe Theatre productions earlier this year. For a description of lively Parnell social life during the 1860s-1900s, read about Charlotte Ruck ‘The Belle of Parnell.’ Related to the Merriman family whose law firm Jackson Russell is still practising in Auckland city, Charlotte charmed all who met her. 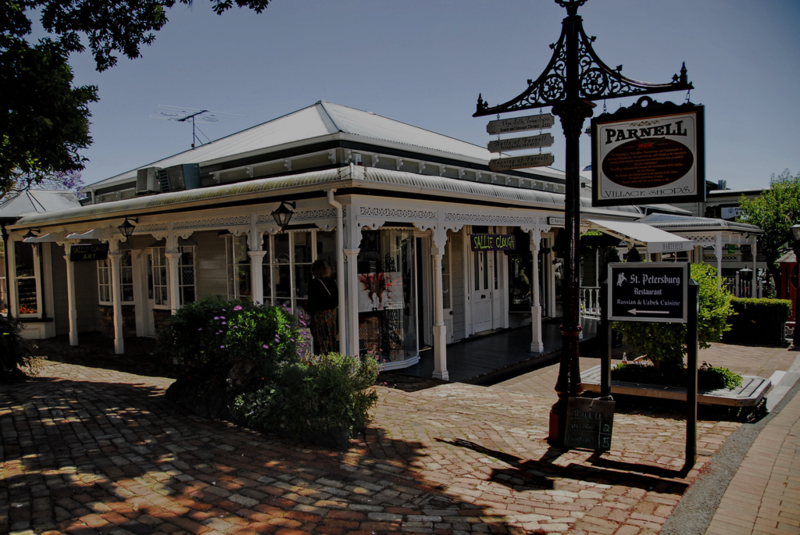 The stories capture Parnell’s history and characters, the range is large – not to be missed! We are pleased to acknowledge the financial support and encouragement of Waitemata Local Board and Foundation North for our Parnell Journal along with supporters and advertisers. It is a sweet moment when we receive confirmation of our application for funding or a donation from an advertiser. With financial and time commitments from executive members the project is on a sound footing. A volunteer community-based organisation would fail without the support of numerous individuals and organisations. We encourage you to purchase previous issues available here tonight, both to give and enjoy. Along with our delightful Parnell heritage themed cards and the ‘Parnell Baths – a Jewel in our Crown’ booklet, we provide a range of choices for purchasers. Gladstone Dairy remains our top sales outlet together with Parnell Paper Plus and we thank them for their continuing support. Stalls at Parnell Market and La Cigale, together with mail orders, provide opportunities for executive members and supporters to display their sales techniques. Any other marketing opportunities you can bring to our attention are appreciated. 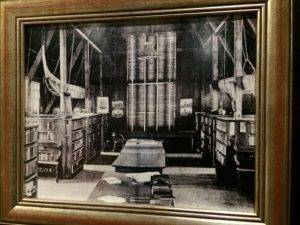 You are invited to Selwyn Library, St Stephens Avenue, at 6.15pm for bubbles & nibbles and an opportunity to hear Bishop Ross Bay talk about the history of Bishop Selwyn, the library and its connection to the Church. More details nearer the event. 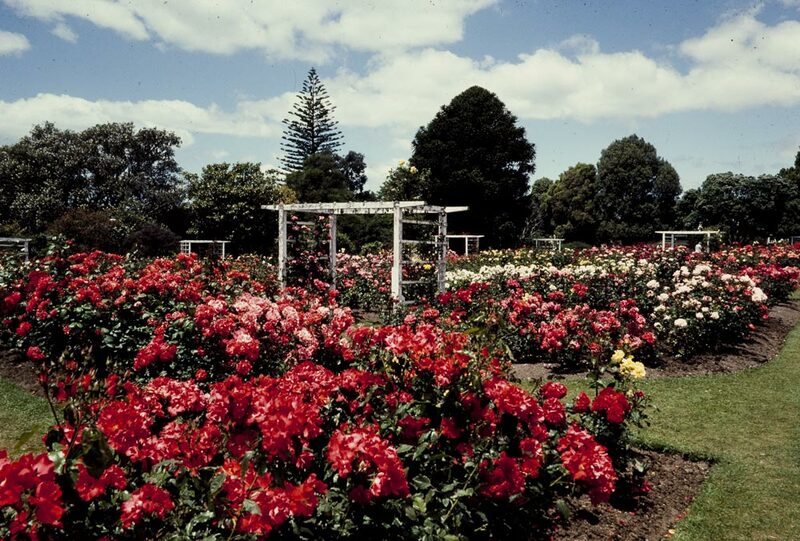 We are very fortunate to have secured the only Parnell Heritage roses available for sale this year -twenty in number. These precious specimens have been potted up, pruned and expertly cared for in Tom Bowden’s garden. 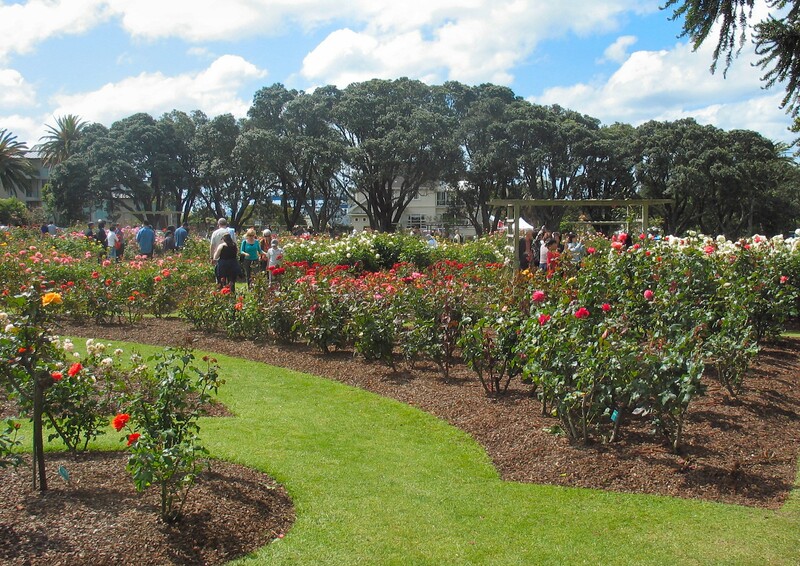 They will be on sale at the one-day Rose Festival in the Parnell Rose Gardens on Sunday November 13 from 10.30am. Rose enthusiasts please note – this is your only opportunity! 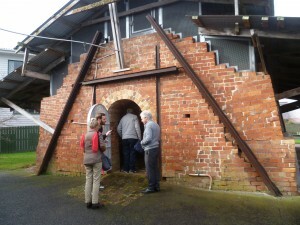 Events can be booked through enquiries@parnellheritage.co.nz and further details are available on our web site. The long-running saga to get the heritage Newmarket Rail Station transferred to the new Parnell Station site continues. We want to acknowledge the tireless work done by Councillor Mike Lee to keep this worthy project from falling off the tracks. Currently it is planned to have the heritage station in place by the end of 2016. At some stage in the project, and despite the signal box being originally designed for the station by the same architect, George Troup, it has not been included in the Resource Consent by Kiwi Rail for transfer to the Parnell site and land wasn’t set aside. Negotiations continue. Along with other parties Parnell Heritage opposed the application to remove these trees but the commissioner’s opinion was that the trees would not now meet the revised scheduling standards and therefore they will be removed, with two replacement pohutukawas planted on the street berms. Kinder House, despite necessary renovations continuing with strengthening of the upper storey, provides a much appreciated meeting place for our executive meetings on the third Monday of every month. The renovations have meant that Parnell Heritage archives have had to be removed to various sites for safe storage until the strengthening project is completed, as advised by Auckland Council. Our records and materials continue to be stored in an increasing number of homes. The offer from Parnell District School to use their old staff room is much appreciated. We now have purchased a new storage cabinet and placed it there and have other storage options to consider. Thanks go to executive team member, John Waterson, who is not only our school liaison but is also assisting in this long term project. While Parnell Heritage has no physical space to house archives or recording equipment, we are exploring a more modern approach to archiving through digital methods and hope this will offer us a fresh avenue for recording those historical artefacts that are the property of Parnell Heritage. I am proud to record that we had a seamless transition from our previous secretary Kay Flower and Sue Andreassen earlier this year – to Kay I want to express our grateful appreciation and to Sue, a warm welcome. Along with doing web training – we have a much improved web site – and getting to grips with all the tasks associated with being our secretary, Sue brings much experience, wonderful shorthand and other skills and what appears to be an endless supply of good cheer and patience. in the Parnell Journal team. We thank you Rendell for your long service and commitment to protecting the heritage of this, New Zealand’s first suburb. Parnell Heritage is fortunate to have a strong team of dedicated individuals on our executive. Each member of the executive team brings commitment, energy and good cheer to their roles. A particularly beneficial development has been the addition of a new volunteers’ support unit which can be called on to assist for events. Beth O’Loughlin is busy here tonight and Jo Buchanan helped with potting up the Parnell Heritage roses. Let us know if you wish to join. I am grateful to Julie Hill for her calm and unfailing support as Co-Chair, and her ability to edit my writing. We thank Alastair Bell and Stephen Goodman for their on-going financial and administrative stewardship. We are very fortunate to have executive members who benefit a volunteer organisation with these skills. They carry the responsibility of keeping our house in order and our Charitable Organisation status accepted by the tax department. While we are in the fortunate position of retaining our current executive members, two of them have expressed the wish that others will come forward so that they can step down after long service. If anyone here is interested in belonging to a lively, busy, interesting community organisation or knows of someone who would be, please see me or one of the executive team tonight or contact Sue or me after the meeting by email or phone. We would be very pleased to hear from you. We thank the staff and management of Quality Hotel for making their conference venue available for our 2016 AGM. We suggest you recommend the Quality Hotel to your friends and relatives who are looking for a warm friendly, well-run place to stay. We also thank Auckland Council who, with Kinder House, has provided us with a meeting space over the past year and this is always appreciated. We are pleased to enjoy a constructive association with Auckland Council and our local Waitemata Board, who continue to support our efforts by various means. As ever, another busy year is planned and there are more causes and ideas than time and resources to execute them. Anyone who has skills in archiving, planning, writing, website management, projects or events or would like to be part of an energetic interesting group is warmly welcomed to our society. Holding to goals of clean air and water, parks and green spaces, a heritage rail station, and a quality old and new built environment for our community is ongoing. Parnell Heritage Inc. has a valuable voice in these discussions and the support of members and other parties is vital. We are proud to be a volunteer society fulfilling a worthwhile role within Parnell.